NEW! Public consultation deadline extended! Public consultation - Have your say! Public consultation - submission deadline extended! 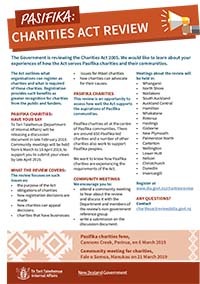 The Minister for the Community and Voluntary Sector, Hon Peeni Henare, recently announced an extension to the deadline for submissions on Modernising the Charities Act 2005. Consultation is now open until 31 MAY 2019. The Department of Internal Affairs (DIA) announced the beginning of the public consultation period on 22 February 2019. At this time, DIA also released a discussion document outlining key issues, as set out in the terms of reference. The discussion document asks specific questions to help members of the public share their experiences and provides examples of how charities currently operate under the Act. You are encouraged to have your say by attending a community meeting or watching the online meeting presentation, and sending in a written submission in response to the discussion document. Submissions can be made by downloading the submission form linked below and returning it to DIA by post or email. DIA recently hosted an online meeting presentation on modernising the Charities Act. This online meeting presentation is the same presentation that DIA staff are making at community meetings throughout the country over March and April 2019. At the end of the presentation, DIA staff also answer some common questions that have been raised at community meetings. This video is now available to watch on demand at the link below. 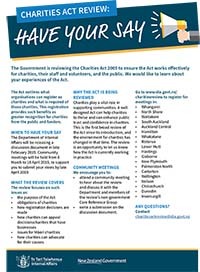 DIA will be hosting 21 community meetings about the modernising the Charities Act. These meetings will be held throughout the country between 6 March and 18 April 2019. Community meetings will be an opportunity to hear presentations from DIA and sector representatives about issues within the scope of the modernisation work. Linked below are the slides shown at the meetings containing the presentations from DIA and sector representatives. Both presentations are included in the same PDF file. Dates, times and locations for the community meetings may be subject to change. Below is a link to the themes arising from discussions during the first weeks of community meetings. The community meetings are an important part of a wider engagement strategy. 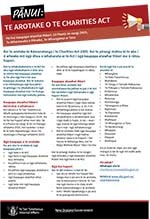 A discussion document was released in late February 2019, to encourage public submissions by 30 April 2019. DIA has worked with key stakeholders to develop an engagement strategy which can be found below. The flyers below outline the key points that will be discussed during community meetings and note why it is valuable for charities to attend. We encourage everyone to share these flyers with their own networks. DIA has established the CRG to assist- work to modernise the Act. As outlined in the terms of reference, DIA will work closely with the CRG to identify issues and possible solutions within scope. The CRG comprises the following six members, who bring a variety of perspectives, skills and experiences to the review:. Dave Henderson (former positions include Chair of Kidney Health New Zealand and External Relations Manager for Hui E! Community Aotearoa). Sue Barker and Dave Henderson of the CRG have received some funding from a consortium of philanthropic community trusts to carry out a research project, aimed at gathering empirical community-sourced evidence to feed into the modernisation of the Charities Act. This research is being conducted in their independent, private capacities, separately from the work of the DIA. For further information, please email davehendersonnz@gmail.com. The charitable sector contributes significantly to New Zealand society. These charities contribute in diverse areas including sports, recreation, arts, culture and heritage, emergency and social services, health, education, religion, conservation and the environment. 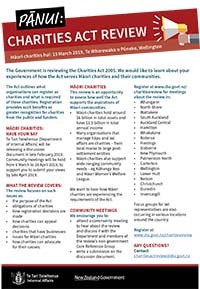 There are more than 27,000 registered charities in New Zealand. The sector has an annual total income of more than $18 billion and it is supported by more than 230,000 volunteers and 180,000 paid part-time or full-time staff. In 2005, the Charities Act was enacted. The Act aims to promote public trust and confidence in the charitable sector. It provides for the registration of societies, institutions, and trustees of trusts as charitable entities. It also places certain obligations on charitable entities, such as annual reporting. Being listed on the charities register entitles an organisation to tax exemptions on most income under the Income Tax Act 2007. Registration on the charities register is voluntary. The original Charities Bill was introduced into Parliament in 2004, and led to establishment of a Charities Commission. The charities register (which provides the purposes, activities and annual returns for all registered charities) commenced in 2007. In 2010, the former Minister for the Community and Voluntary Sector announced an intended review of the Charities Act 2005, to assess both the effectiveness of the Charities Commission since its inception in 2005 and the “charitable purpose” definition. In 2018, the Minister for the Community and Voluntary Sector announced that a review of the Act would be undertaken, noting that while the fundamentals of the Act are considered sound, there are a range of substantive issues that would be considered. The February 2018 edition of the Charities Services newsletter outlined that preparatory work to begin a review of the Charities Act was well underway. The Minister announced the terms of reference for the review in May 2018. The Minister will be the key decision maker on the review, with some decisions also requiring Cabinet approval. The Department of Internal Affairs will be the lead agency. The full terms of reference can be found above. See: Earlier documents.